The poet, playwright and children's author Charles Causley, famed for the poem I Saw a Jolly Hunter, has died aged 86. His career included winning the prestigious Queen's Gold Medal for Poetry. 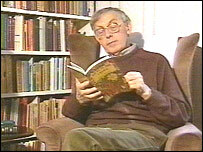 The Cornwall-born writer also served on the Arts Council's poetry panel and was made a CBE in 1986. He was a popular choice for poet laureate after the death of Ted Hughes and worked as literary editor of two BBC radio magazines. 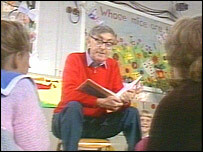 He started writing in the 1930s and published more than 50 books and collections of verses for adults and children. Former Grand Bard of the Cornish Gorsedd, John Bolitho, paid a glowing tribute to Mr Causley. "I think he was Cornwall's greatest poet and he should have been made poet laureate years ago," he said. "I always liked his Navy poems. They were tremendously perceptive and illuminating and wonderfully recognisable." Mr Causley's first works included plays entitled Runaway and The Conquering Hero. In World War II he served in the Royal Navy, and recounted his experiences in a series of short stories called Hands to Dance and in poetry. In the late 1990s a campaign was launched to make him the first Cornish poet laureate. Critics say Causley was a consistent writer through his long career, able to keep a ballad alive and adapt to changing forms. "All his numerous literary awards and prizes were greeted with his typical modesty"